I was born and raised in Prince George, BC, and currently live in Victoria. My racing career started in 1999. In 2000 Kawasaki Canada got behind me and supplied new equipment for the season. With Kawasaki's support came other support from local businesses and I had a relatively competitive year in 2000. For 2001 I focused on getting the right people behind me to get the desired results. With this support I consistently placed among the top 5 in each class I entered. In 2002 I was signed to ride for a US national team, Zlock Racing. Under their tutelage and support I finished within the top 4 overall in each respective class I contended in the US. 2003 saw me re-signed with Zlock Racing to race a few selected AMA National events, including Daytona, as well as several WMRRA, OMRRA and WMRC rounds. The season was an outstanding success with podium results achieved at virtually every event we attended. 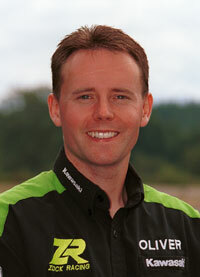 2004 saw me once again signed with Zlock Racing. We won a SuperMoto championship, placed runner up in another series and finished on the podium in almost every other event we attended. We were also afforded the opportunity by BMW Germany to compete in the BoxerCup round held in Valencia, Spain, in late October where we finished in the top ten. 2005 was a banner year. Once again we signed with Zlock Racing and managed to capture the 2005 WMRC #1 plate by winning both the SuperBike and 600 Supersport classes. 2006 saw me signed to race for the BMW factory in the Parts Canada SuperBike Championship contesting the Canadian Thunder Series aboard the brand new R1200S. With Dan Zlock as my crew chief, we managed to win the first national race on a BMW in over thirty years. Unfortunately, we came up just a few points shy for the championship that year, although we won more races than any of our competition. In addition, despite a hectic schedule, we defended our WMRC championships and managed to capture the 2006 overall #1 plate for the second year running. 2007 saw me focusing on US championships riding for Dan Zlocks private team. Unfortunately I was injured while leading a race in Portland, and badly broke my right leg. Despite the injury and subsequent surgery and rehabilitation, we were back to racing, and winning, less than two months later. 2008 was a big year for me personally. Coming back from a near career-ending crash in 2007, Zlock Racing showed their faith in me and re-signed me for 2008. Thanks to a lot of luck and phenomenally good equipment, we managed to win the WMMRA overall championship - the first Canadian to do so. In addition, we captured the combined NW Championship Series Championship. 2009 - 2011 - I was lucky to race, and had continued success, with some of the best people in the business. With the economy being what it was I had to take a hiatus from racing until 2015. 2015 - See's me signed to ride for Zlock Racing in the NorthWest series. Please be sure to check on our race reports for all the latest results and information on our current season.